Our Gorillas have a message for the people of North Bay – your gutters need cleaning! Whilst our technicians were swinging about town, they noticed that many homes and businesses are in need of North Bay gutter cleaning. Your eavestrough is such an important part of your property but it can be tough to get at. If you are in need of a system clear-out, call our Gorillas for your North Bay eavestrough cleaning. Every year North Bay receives 2.5 feet of rain. If gutters are not clear to move the water down and away from your home, where would it go? The roof of your home collects organic matter year-round, particularly during the changing of seasons. Leaves fall, winds push debris, and is more than likely they will end up in or around the gutters of your home. This debris forms a base inside your gutters. This base prevents rain water not only from draining but from carrying out waste down with it. Having a clogged eavestrough does more than just affect the drainage system itself. A clogged eavestrough can allow water to back up, damaging construction materials and weakening your roof as a whole. In addition to wearing away at your structure, a blocked eavestrough can also invite unwanted guests. Insects, pests, rodents and other small animals are always going to be a part of your surroundings, wanted or not. When your eavestrough is clogged, you are providing these pests with a damp, covered place to call home. So how do you stop this from happening? By making our North Bay eavestrough cleaning a part of your regular routine. North Bay Eavestrough Cleaning: Why Call The Pros? Trying to take care of your North Bay eavestrough cleaning on your own can be dangerous and – let’s face it, pretty aggravating. 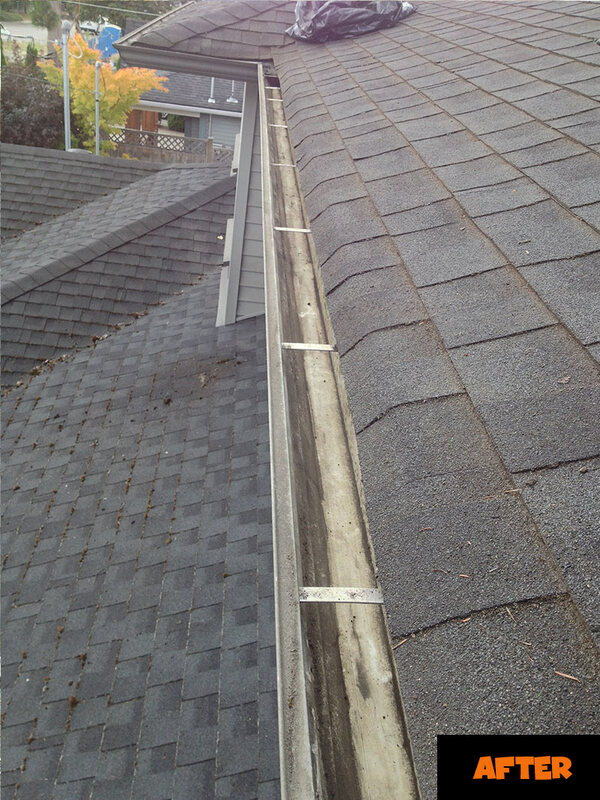 When you call in a reputable service for your North Bay eavestrough cleaning, you can avoid both. 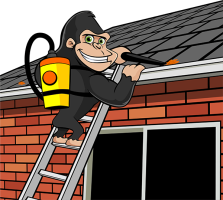 Our Gorillas show up to your space with all the right safety tools to carry out your service without incident. As good as our safety measures our, our tools are just as great. By using vacuums to clean out gutters, you are guaranteed a better result than simply cleaning by-hand. Instead of powering down and walking away, our Gorillas work closely with our clients. Before and after photos are supplied before any job is considered done. Water tests are also included to ensure that your system is free-flowing before our Gorillas call it a day.